Antique Heriz carpets are woven in village and towns in the East Azerbaijan region in the mountainout area around Tabriz in the northwest of Iran. The style is named after Heriz, the largest of these towns. Traditional Heriz carpets feature distinctive large-scale motifs and a wide palette of warm colors, making the antique Heriz rug one of the most highly coveted Persian village carpet styles. Many Heriz carpets show the colors and design influence of Caucasian rugs due to the proximity of Heriz to that region. Persian Heriz rugs are instantly recognizable for their bold blues and rust red colors, with pinks, yellows, greens and ivory for contrast. Unlike more traditional Persian rug styles such as the Kashan rug, which flowing, curvilinear arabesques and scrolls, Heriz Persian rugs are known for their rectilinear designs. The merchants of Tabriz sought to combine the elegance of traditional Persian carpets with the tribal charm of village weaving. Weavers adapted the geometric weave to create the signature Heriz style, typified by the classic “diamond on a square” medallion motif popularized in the late nineteenth century. In most traditional Heriz rugs, the design elements are outlined by two lines of contrasting colors. Modern Heriz rugs are often dyed using chemicals, antique Heriz rug makers were masters of vegetable dyeing. Vegetable dyes acquire a marvelous patina as they age. As is the case with Kashan rugs, Heriz rugs often feature a color technique called abrash, which varies the color from one end of the rug to the other through color shading or tone shifting. Heriz antique rugs, creates remarkable strength and depth of color and design. The best antique Heriz rugs are woven with wool from the Shahsavan, a nomadic tribe residing in the Elbrus Mountains. Later, wool high in lanolin was imported from Tabriz. A Heriz Persian rug is loosely knotted upon a thick, sturdy cotton foundation. The knots are tightly packed, giving the rug impressive durability. 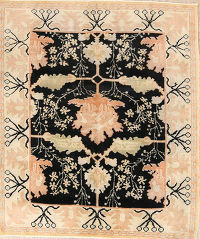 Popular variations of the Heriz rug are the Serapi and Gorevan styles. Heriz Serapi rugs, typically made before the 1900s, feature a finer a weave and curvier design. Gorevan rugs are known for their coarser grades. These carpet styles were originally developed in the town and villages neighboring Heriz, though today their names are used as a measure of a rug’s quality. In the United States, the best quality Heriz rugs are called Serapi carpets.